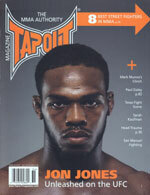 Unedited interview of TXMMA founder Paul Erickson for Tapout Magazine issue 36, April 2010, conducted by Jerry MacReady. 1. When was TEXAS MMA founded and what led you to create a community to unify the MMA movement in Texas? “TXMMA was founded essentially early 2001, ironically as an indirect result of Zuffa purchasing the UFC. I was an ex-wrestler who had been a UFC fan since the mid-90’s, and got my first direct involvement in the scene when I first trained BJJ in Houston with now-Machado black belt Alvis Solis. As I trained here and there and continued to watch more MMA in various flavors (UFC, Pride, Rings, Shooto, Pancrase, etc. ), my interest in the sport only continued to grow. As with a lot of people who were early fans of this sport, I was a fan to the point that I loved to talk about it, and evangelize it to anyone who would listen – particularly those who at the time (and they were the majority) still believed it was a barbaric bloodsport with fights to the death. In January 2001 my girlfriend at the time, Sounthaly “Tune” Outhavong, and I found ourselves in an interesting position. I had met her at an MMA gym, and we were both professionals with master’s degrees (her: public relations, me: marketing) who had just recently been laid off. The Fertitta brothers had just announced their purchase of the UFC from SEG. In chaos there is opportunity, and she suggested that given my love for the sport we had nothing to lose by trying to see if we could work for Zuffa. Over a couple of weeks, we secured a projector, crafted and massaged a pitch and Powerpoint presentation, and headed to Vegas despite still not having been able to secure an appointment with any principals at Zuffa. We went out there regardless, determined to make it happen. While in Vegas we essentially spent several days being persistent on the phone and finally got through, and got an appointment with Dana White. It was chaotic, since Zuffa was still in the process of moving into the former Expedia/Travelscape office space underneath Fertitta Enterprises, and Dana was still getting up to speed on the job. Apparently despite all the variables both we and our pitch presented well, since Dana was under the perception for a few days that we were actually a professional firm and not just two passionate individuals wanting to uproot themselves and work for Zuffa. It wasnt meant to be, however, as Zuffa was not in a position at that time to be hiring us, mostly bringing over existing people from Station Casinos and Fertitta Enterprises and also flirting with a major pay-TV network to handle all their marketing and promo work. 2. Since the sport got officially passed under what is considered the “unified rules,” can you describe how quickly the MMA scene changed in the state? “As anyone who’s been around in the Texas scene for a while knows, the road to getting Texas on board with the unified rules has been a long, difficult, and fortunately victorious one. I actually was the person that physically first put a copy of the NJSACB and NSAC rulesets into TDLR (Texas Dept. of Licensing & Regulation) Combative Sports administrator/director Dickie Cole’s hands, over coffee in a downtown Austin Starbucks in late 2001. He shared them with his friend and longtime kickboxing promoter Steve Armstrong, who then began working with him on creating a version for Texas. It still took a few years for Texas to ultimately adopt its implementation of the unified rules, after years of running under what was termed “Pankration” rules that did not allow closed-fist striking. Since that time the pace of MMA events has slowly but steadily grown in the past several years, particularly after amateur MMA was approved. Promoting is still a tricky business in general, but it is a far more attractive proposition in Texas today thanks to the more fan-friendly unified rules now in place and far greater public awareness and appreciation of MMA – largely due to the UFC’s success after the first season of the Ultimate Fighter. The result in the end has been a greater and more regular number of opportunities for amateurs and pros to fight these days, and now an MMA fan in Texas can enjoy a state MMA scene that seemingly has fights every month to month and a half. I can’t tell you how great it is to see how far the scene has come compared to the mess it was back in the day… there’s never been a better time to be a fighter, fan, promoter, or instructor in this state, and I’m very happy about that. 3. Unfortunately Texas holds the distinction of the first recorded death via an MMA match in the U.S., though it was amateur. What are your thoughts on this tragedy and how can promoters/commission and the sport work to keep this type of thing from happening, especially after the wake of deaths from amateur toughman competitions that led to that faux pas sport dying altogether? “It’s still difficult to sort things out with Sammy Vasquez’s death, even after a couple of years. This is one of those situations where there’s really no clear person or organization to blame for what happened – and that’s a horrible conclusion to come to when you have someone’s death involved. People want answers, a culprit, and a clear resolution or result. In this case, however, even a review by the TDLR concluded that all the requirements for medical screening, cage padding, and so on were adhered to. There may have been something pre-existing that didn’t show up, or the type of trauma responsible for doing the damage was something very odd and unpredictable, but that’s all conjecture. The larger question is, how did this happen despite all the rules being followed? There are no easy answers. We know that regulated MMA will never be Toughman or have Toughman’s death rate – there are real medical screenings, medical suspensions are observed from state to state, and so on. Despite this, there’s probably still a bit of room to improve as time goes by. My thought is that as MMA as a regulated sport evolves, boxing/athletic commissions and their medical advisory boards should continue to observe the potential for head trauma in the various circumstances, angles, and surfaces presented by MMA in a cage and in a ring, and begin evolving in their requirements not only for pre-fight medical screenings, but also safety padding and practices to be observed by promoters.